Details relating to the San Marino Commemorative of 2014. 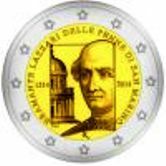 The coin was issued to commemorate the 500th anniversary of the death of Donato Bramante. Donato is considered by many as the initiator of high renaissance architecture. He designed the new dome of St.Peters in Rome, work on which began in 1506. In the inner ring of the coin Donato is shown looking to the left and next to him a representation of the renaissance chapel “Tempietto di Bramante “in Montorio. The chapel is regarded as an outstanding example of high renaissance architecture. The presentation is interesting as Donato and the chapel are enclosed in a frame that gives the appearance of being a page in a book. Around the edge of the inner circle is the inscription “BRAMANTE LAZZARI DELLE PENNE DI SAN MARINO” loosely translated as “Bramante Lazarri of the pens of San Marino”. The initials of the designer - ”MCC” appear at seven o’clock and the mint mark ”R” appears at six o’clock. Return from San Marino Commemorative 2014 to euro coin collector.